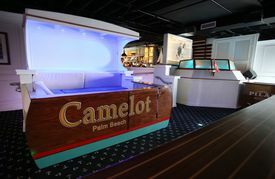 Camelot, a unique restaurant/lounge/night club just steps away from my home, opened after much anticipation in the late Summer, 2014. Having been drawn to the concept of bringing a JFK-inspired, 1960s Palm Beach style venue to the West Palm Beach waterfront, I applied for membership long before Camelot opened its doors. And as it is said, “membership has its privileges”. Recently, Camelot informed members that “Bubbles and Blues” would be held every Friday evening throughout Season. “Bubbles” – Veuve Cliquot at $9 per flute – to perfectly compliment “Blues” ($1 Blue Points). Needless to say, there was no way that I was going to miss the inaugural event. I arrived shortly after five and staked out two seats by the oyster bar. Minutes later I was joined by Don Todorich, one of Palm Beach’s leading REALTORS and a frequent dining companion. Camelot’s newly hired executive chef, Joe Bonavita, introduced himself and started talking to us about oysters. Chef Bonavita, who grew up in Long Island, New York, told us that from a young age, he often went fishing with his father, afterwhich they would prepare the day’s catch in their kitchen. From a very young age, he realized that cooking was his true passion and that the sea was his source of endless inspiration. It did not take us long to realize that Joe really knows his seafood! 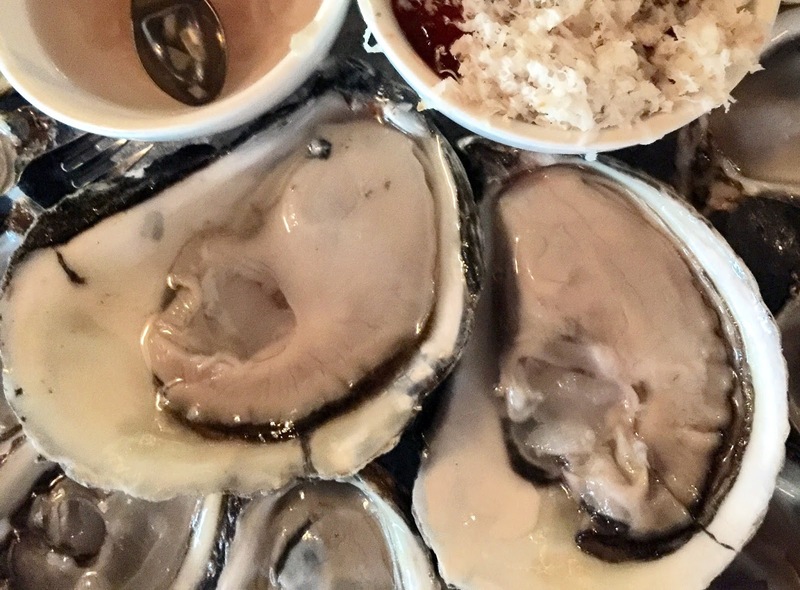 The chef works with shellfish purveyors up and down the East Coast, including Sea to Table, Blue Island Oyster Company and Island Creek Oysters. He also knows individual fishermen who text him almost about what they have caught. 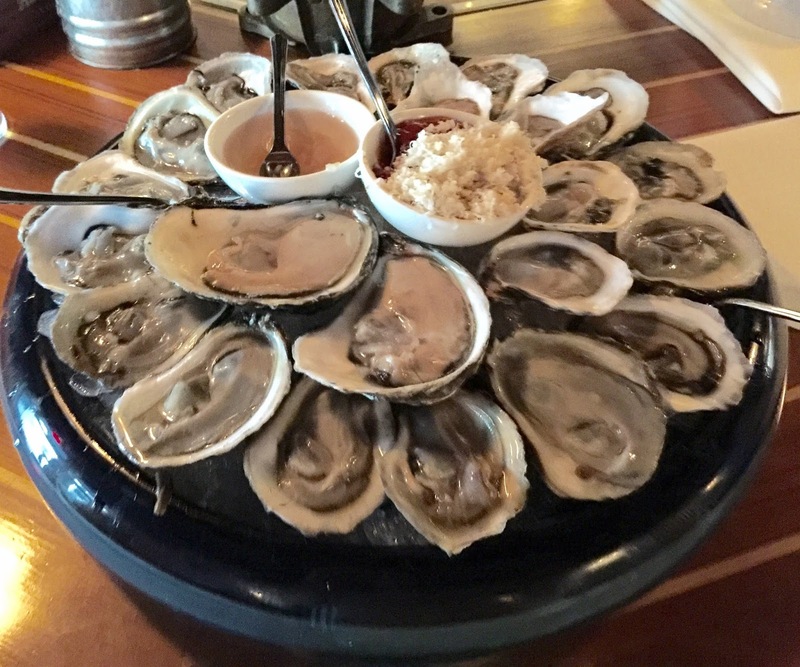 These relationships ensure that the freshest oysters, clams, lobsters and fish are flown out each morning, so that the bounty lands at Palm Beach International Airport in time to print up the day’s menu for Camelot’s raw bar program and ever changing menu items. Chef Bonavita, who studied at Le Cordon Bleu College of Culinary Arts in Chicago, is a man after my own heart. (I’m willing to bet that Rodney Mayo, the genius behind Camelot and several other successful South Florida restaurants and clubs, has plans for his talents beyond Camelot. (The chef has worked in Boston, Chicago, Miami Beach and New York with chefs Graham Elliot, Grant Achatz and Todd English, including a stint at Alina, a 3 Michelin starred restaurant). While I generally eat my oysters “naked”, I was curious to see what the secret ingredient was in his mignonette (in addition to the obvious french Champagne vinegar and shallots). It turned out to be a nice SeaGlass Pinot Grigio from Santa Barbara, If was definitely worth a taste. Despite having advertised the ubiquitous Blue Points, Joseph had obtained Blue Islands ($3 each when it is not happy hour) from Great South Bay, near Fire Island in New York. So, we began ordering by the dozen. The crisp wild oysters were lightly salty, with a sweet body finishing with a hint of celery. The time came to sample the specialty oysters Joseph had selected for the evening. He presented us with Tomahawks ($3 each) from Shinnecock Island (just south of Southampton, Long Island, New York), explaining that these were the only oysters produced by Native Americans. The Tomahawks were huge with shallow, jade colored cups. Contrary to what one would expect from an oyster this size, the chewy Tomahawks were pleasantly salty and sweet (almost buttery!) with a slightly herb finish. Next we sampled medium-sized Black Duck Salts ($3 each) from Hog Island, Virginia. Although saltier than the previously two varieties we tasted, they were perfect the way they are. The crisp, sweet oysters featured an enjoyable grassy finish. 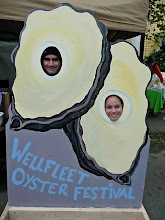 To round out his oyster selection, Joseph offered some farmed Kusshis ($4 each) from Deep Bay, in Northern Washington. While most Kusshis are generally very small, these were slightly larger. The soft, yet meaty, flesh filled the deep cups. The Kusshis had a delicate flavor and a faintly salty finish. 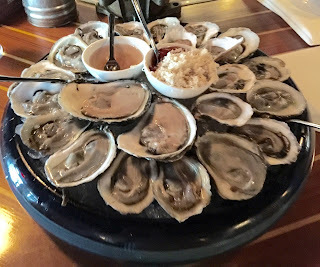 Joe, a master at preparing shellfish and seafood (with a modern flare) using local Florida ingredients, also insisted we try a few items from the day’s menu – Gloucester scallops and perfect Bigeye (Ahi) tuna sashimi. Joe’s goal is to make Camelot a destination for oyster lovers as well as a nice quiet dinner spot where you can come and have a great meal. But as day turns to night and Camelot turns into a night club, the chef gets creative with shellfish towers, caviar service, even their own version of a "krabby paddy" (but only around midnight on Saturday nights). Needless to say, I’m looking forward to this Season at Camelot.